Some 10 km from the city of Jaisalmer, there is a quaint, small town known as Satto, where Sakur Khan hails from. Sakur Khan had always aspired to be a musician and was mostly tutored at home. Like all other members of Manganiyaar community, his family has been singing for the royal families since generations. Satto Khan’s inspiration has been his uncle, Nazeer Khan and he wants this art to pervade into the future generations. Satto Khan belongs to the Alamkhaana gharana of the Manganiyaars. He has been singing since the age of 8. Simple, humble and not very talkative, Satto Khan explains about his music with a sense of calm, and with a composed articulated manner. As he talks about the Alamkhaana history, Sakur Khan explains, that there are four sub-castes even amongst Manganiyaars, namely, “Bhand”: Jesters in the royal courts, “Nagarchi”: People who play the ‘Nagada’, a sort of large drum, ‘Dagga’ people who played the dholak, and ‘Chandani’. His group has performed many times in the royal courts and the songs are customized for the Maharajas. Unlike other groups who combine classical and folk raagas, his group is only into pure folk music, and follow the traditional system of 6 main Raagas, and 30 raaginis. (wives of raagas, as per mythology). 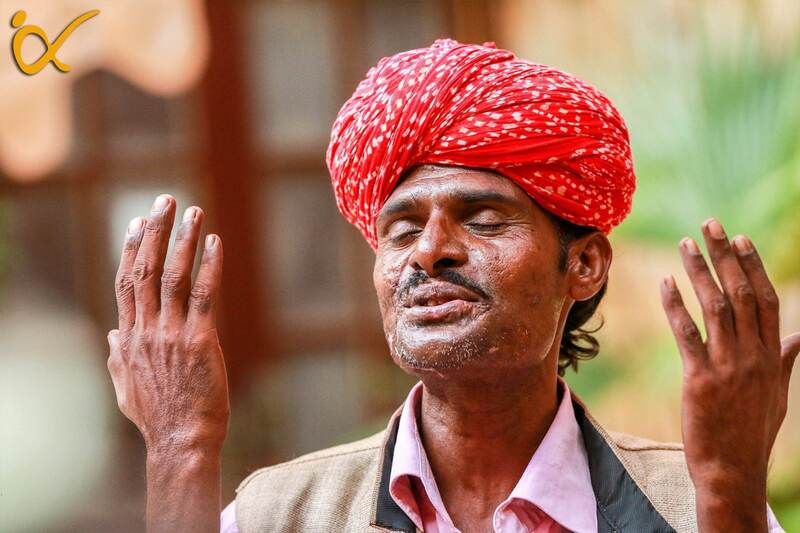 At times, singing styles like Dadra are improvised on the spot. This 36-year-old also teaches in Gunsaar organization, set up for musical training of the Manganiyaar community. One of his main principles has been to always lend a helping hand to others, as he believes that God watches over all of us. The Almighty is the one who does everything. True to his words, when he sings, it seems that the Almighty himself resides in his voice. Some of his songs, as he recalls, are more than 100 years old, and has pervaded through generations by musical teaching and training. Music is imbibed in Manganiyaar families since the beginning of a newborn. He sings with a powerful and moving voice as his fingers began to play on the harmonium. Like other Manganiyar singers, his songs too have a varied range of themes, from childbirth, marriage, sweet conversations between a husband and his wife, and the transition of seasons. It’s really appalling to enhance these elements of nature through poetic words and songs. These songs beautifully convey the emotions of women, who wait on for their husbands or lovers who promised once to come back to them soon but are far from their wives in search for material prospects. On the occasion of “Teej”, a festival in North India to celebrate the arrival of monsoons, these women gather in a group and sing songs dedicated to the rains, while simultaneously recalling about the ‘false promises’ their spouses made to them. Oh my beloved (baalam ji), the clouds are pouring the heavy rain! Sakur khan is a song composer too, and through his songs, he pays a tribute to women and their “Shringaar”, which literally means ornamentation or the way the women deck up themselves to please their husbands. One can almost feel the pain of these women who dutifully abide by their husbands’ whims and fancies, yet, their love for them is unending, and their devotion towards them never dies, just like the music of Jaisalmer. Raag Desh is one of the important raagas in Manganiyaar folk music. Sometimes this raga is used in its pure form, while at times, its derivations are used. Raga Desh in Hindustani classical is mostly used to invoke a sense of patriotism, a sentimental patriotic feel. Most of these songs are composed in “Kairava” taal. Such is the music of Jaisalmer, embedded in its golden sand dunes and engraved in every stone of the majestic living fort-city. Manganiyaar communities like that of Sakur Khan have kept their tradition alive through all these years through Guru-Shishya parampara, (teacher-disciple tradition). They have been entertaining the royal families since generations and their contribution to musical history is as vast as the Thar desert itself. The elegant use of poetry and numerous metaphors is what makes them different. Every nook and corner of Jaisalmer is filled with several Sakur Khans who are trying to carve a niche with their individual uniqueness. As Jawahar Lal Nehru says, “India is like a palimpsest”, with layers and layers of thoughts and reverie inscribed on it. Such is this music of Manganiyaars, which have layers and layers of voices, history, folklore, love and melodies.